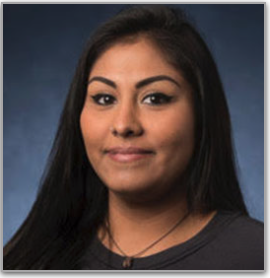 Karen Sandoval joined us in December of 2015. Karen began her career with Mid-Atlantic Spinal Rehab as a front desk administrator. She then expanded her role into Patient Care Coordinator for the office. This means that she oversaw the front desk and made sure that we were able to verify insurance benefits prior to patient appointments and that we were able to pre-certify care for patients in need. Karen’s role in the company has changed and she will function as our office manager beginning in January of 2018. Her primary role will be to run the day to day operations of the clinic and to handle the training of all office staff. She enjoys going the extra mile for patients and says that no job is too big or too small for her to take on in the office. Karen is fluent in both English and Spanish. Karen graduated from Franklin High School in 2011. She has held several different jobs prior to joining our team. She has worked at ABC Party and Tent Rentals as a front-end manager and has worked for a personal injury attorney representing injured claimants. She is very knowledgeable about the process of recovering from injuries and can answer just about any question you may have about your Baltimore auto accident injuries as well as how to go about opening a no-fault PIP claim if you’ve been injured in a Baltimore auto accident. When she is not working, Karen enjoys hanging out with her brother, spending time with her dog, Sol, dancing, and listening to music all day. We are excited to have Karen as our new office manager and we look forward to her contributions for many years to come.